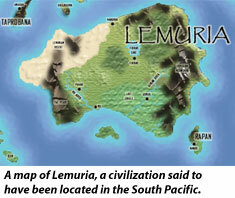 Lemuria was an ancient civilization which existed prior to and during the time of Atlantis. It is believed that Lemuria physically existed largely in the Southern Pacific, between North America and Asia/Australia. Lemuria is also sometimes referred to as Mu, or the Motherland (of Mu). At its peak of civilization, the Lemurian people were both highly evolved and very spiritual. While concrete physical evidence of this ancient continent may be difficult to find, many people "know" that they have a strong connection to Lemuria. Many have gone in quest of this mythological continent. Through legends, archaeological evidence, metaphysical channelings and theories pieced together by researchers, one can only speculate on the rise and fall of Lemuria. Lost civilizations have been known to appear and disappear without explanation. The exact location of Lemuria varies from different researchers and authors. It is considered part of the mysteries of the Pacific region into the American continent, much the same as Atlantis is linked to the Atlantic land areas that stretch to the Mediterranean Sea. The location of Lemuria is linked with the ‘Ring of Fire'; an area that became active with a Tsunami on December 26, 2004. Powerful earthquakes and volcanoes continue after years of being dormant. It would appear that Lemuria is once again speaking to us with warning signs. Edgar Cayce called Lemuria Zu or Oz and is also referred to by others as Pacifica and Mu. The fate of Lemuria is not unlike the proposed fate of Atlantis. It is much like the destiny of humanity foreseen by prophets of ancient times and modern day clairvoyants. Many believe that Easter Island was part of Lemuria. It has hundreds of colossal stone statues and written language that point to an advanced culture, which appeared on the world's most remote spot. The legend of Easter Island speaks of Hiva which sank beneath the waves as people fled. Polynesians have handed down the story of a civilization in the Pacific that was motherland of mankind (Mu) for thousands of years. The name Lemuria resulted from a Nineteenth Century controversy over Darwin's Origin of the Species. Defenders of Darwin had trouble explaining how certain species became distributed over large areas. The Lemur, which zoologists have had a hard time explaining their distribution, are small primitive forms of primates found in Africa, Madagascar, India, and the East Indian archipelago. Some zoologists suggest a land mass in the Indian Ocean between Madagascar and India, millions of years ago. An English zoologist, Phillip L. Schlater, proposed the name Lemuria (LEMURia) for this former land of the LEMURS in the Indian Ocean. Some place Lemurians at roughly 75,000 to 20,000 B.C. (prior to Atlantis) while others speculate that Atlantis and Lemuria co-existed for thousands of years. It is speculated that the survivors of Lemuria relocated to Mount Shasta, California. Mount Shasta can be considered one of the most sacred places on this planet. It is a mystic power source for the planet; this sacred mountain is the incarnation of the Great Central Sun of this universe. It is the focus of angels, spirit-guides, spaceships, masters from the light realm, and the home of the ancient survivors of Lemuria.